"Sir, let those laugh that win." 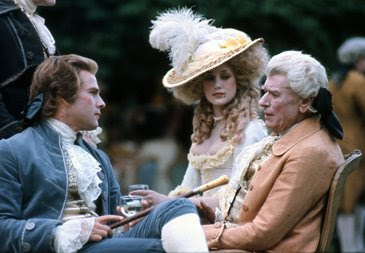 Barry Lyndon (1975); directed by Stanley Kubrick; produced by Stanley Kubrick; adapted by Stanley Kubrick from the novel The Luck of Barry Lyndon by William Makepiece Thackeray; cinematography by John Alcott; editing by Tony Lawson; musical score (adaptations) by Leonard Rosenman; distributed by Warner Bros; Awards: Won Academy Awards for: Best Cinematography; Best Music; Best Art/Set Decoration (Ken Adam, Roy Walker, Vernon Dixon); Best Costume Design (Ulla-Britt Söderlund, Milena Canonero); nominations for Best Picture, Best Director, Best Adapted Screenplay; for a full list of awards and nominations, go here. For my money, Stanley Kubrick is one of the greatest directors who ever lived and this film is one of the four masterpieces he released between 1968 and 1980. If pressed, I would probably name it as my favorite of the four, though there were, upon its initial release, elements I had to overcome. And that, in part, indicates the value of film retrospectives. It’s rare that one’s first sense of a film remains in place without modification. I was 16 when the film came out and I was pretty much appalled that—with so many exciting actors around doing some of their best work—Kubrick would settle on Ryan O’Neal as his star. The associations with Love Story were simply too recent. Now, I barely remember that Love Story exists and was the huge box office hit of 1970. 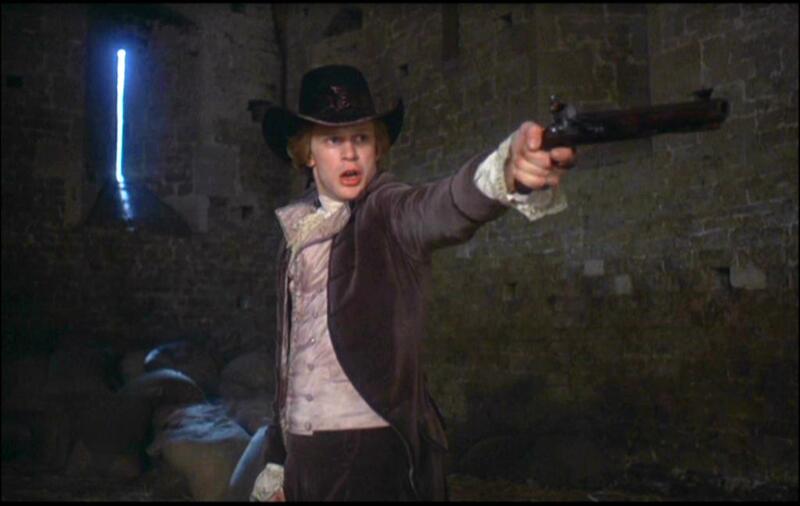 Was O’Neal “good box office” for Kubrick’s film? I neither know nor care. I have come to accept him in the role, even to prize him, mostly. For he is affectless at times in a way that is necessary to this gullible and “game” young man. And he manages to speak the stilted lines of the script with the lilt necessary to suggest his own awareness of how little his words declare. O’Neal’s Barry Lyndon is a man in love with a self-conception that he himself is rarely conscious of—or, perhaps, that he is not able, consciously, to estimate. He can only apprehend himself as a reflection from others, and O’Neal is quite good, finally, at showing us a man who is only ever what he “seems,” for there is nothing that he is. Of all Kubrick’s films, this is the one where subtleties of acting are key to many scenes. Yes, the scenes look exactly like 18th century paintings, but the actors in the “paintings” are vivid in their meticulous manners and costumes. They must take pains to be as full of decorum as the settings call for, and yet every deviation reveals a seething life beneath the niceties. Think of Sir Charles Lyndon (Frank Middlemass)’s challenge to Barry at the end of Part I, and the moment—both affecting and comical—when it’s clear he realizes he’s doomed. 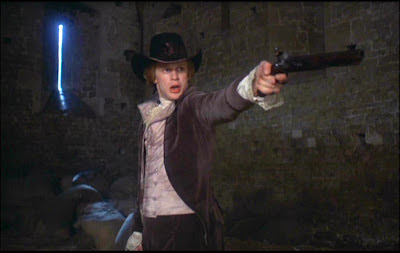 Think of Barry’s attack upon Lord Bullingdon (Leon Vitale); think of the coiled snake in the eyes of Barry’s mother (Marie Kean) as she dismisses the supercilious Reverend Runt (Murray Melvin) who gradually lets himself become indignant. Think of Philip Stone's Graham in his breathless and nervous, yet measured, announcement of the terms Lord Bullingdon will extend to the wounded Barry. Think of the duel in which Barry is wounded—the looks on the faces of the seconds and the overseer are wonderful in their unflappable sangfroid—where the excruciating pace of the proceedings is an epitome of what the film is getting at. Every image is exquisite. The score is lordly—ringing variations on certain recurring pieces that clue the viewer into the film’s view of what we’re seeing. When I say “film’s view” I mean Kubrick’s view, of course, but because music and voice-over narration are used the way they are, the meaning extends beyond Kubrick to a view that is almost cosmic. Granted, Kubrick had already established himself as the most audaciously cosmic director alive with his film 2001: A Space Odyssey (1968), and had followed it up with A Clockwork Orange (1971), a film that established his viewpoint as not only ironic—sardonic even—but also capable of a magical detachment that could render what we see on the screen as both artfully contrived and viscerally interesting. 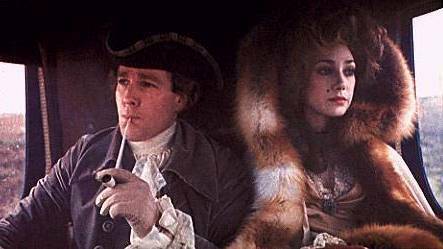 Barry Lyndon, I’d say, combines something of both in what I take to be the film closest to what I imagine to be the central idea of Kubrick’s film-making. Here, he takes up again the tale of a ne’er-do-well, but the very civilized trappings that were lampooned and/or ripped away in Clockwork are allowed to control almost every aspect of life. And that control is in the name of a knowing detachment from the ups and downs of history and of private and public life. 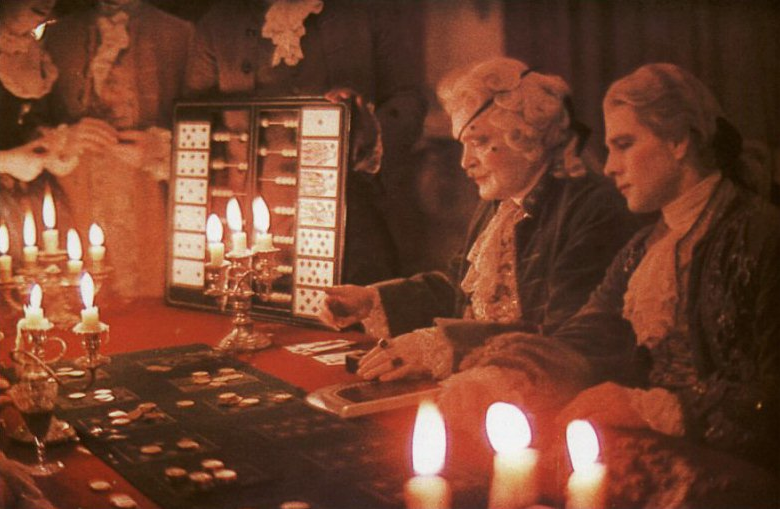 Barry’s story becomes, in Kubrick’s hands, the tale of an everyman, oddly enough. It’s an American’s view of how upstarts—whether Yankees or Irish—fare in the cultural stakes of the well-born, well-mannered, well-off world of British aristocracy. And its tone toward the proceedings is mildly amused, able to see its characters, of no matter what age, rank, appearance, skill, virtue, as equally tied to the forces of fortune, which nobody rules. Barry, like all of us, ultimately, is undone by circumstance. In a sense, he is the “bad guy” in his own life because he brings upon himself the forces that undo him. Don’t we all? Kubrick’s idea is to get at the hollowness of “the hero,” no matter how he comports himself in the tale he is making happen. There is no way for an outcome to match his self-conception; if, as with Barry, he attains a pinnacle, he cannot stay there. The odyssey is always toward a manifestation of inadequacy. We aren’t equal to our own lives, and Kubrick shows this by the painstaking effort he puts into creating a world in which his point will be made. Indeed, a world that makes his point for him. 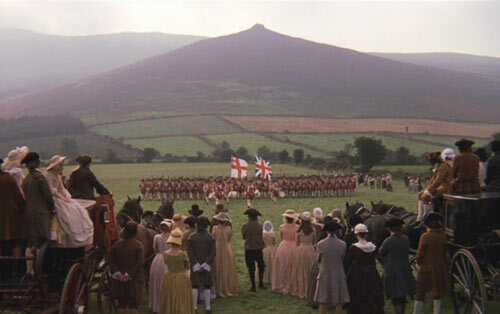 And of all the cinematic worlds he created, Barry Lyndon is the most indelible, the one where Kubrick’s status as the supreme Eye is made apparent in every frame. I’ve already mentioned the changes I’ve experienced in watching the film. I seem to remember wanting to like the film more than I actually did. I suppose I wanted a hero in the film to match “the hero” behind the film. As the first Kubrick film I saw on its release, Barry Lyndon could not help but impress me with the sheer artistry of its director. The control exercised on every aspect of the sights and sounds of this film is extraordinary. And yet that very control—the perfection of its pacing as an aspect of its theme of manners as a gloss on life, as art is at times a mirror of the perception we want to have of ourselves—led to outcries that the film was lifeless. My experience was to find the film hypnotic; one watches it—and here I’m speaking of the “it must give pleasure” aspect of the film—as one listens to music, eyes led by the rhythm of Kubrick’s camera (John Alcott, who joined Kubrick on 2001, and was his cinematographer for the next three films, and who won an Oscar for this one). Then there's the telling use of music—the Sturm und Drang rendition of Handel’s “sarabande”; the clockwork minuet of Rosenman ‘s adaptation of Schubert’s piano trio in E-Flat, that seems to use the interplay of piano and strings to draw out the interplay of time and desire; Vivaldi’s cello concerto in E minor which highlights, each time it is played, the romantic aspects of the film, seeming to be a musical expression of the fluttering emotions in Lady Lyndon (Marisa Berenson). 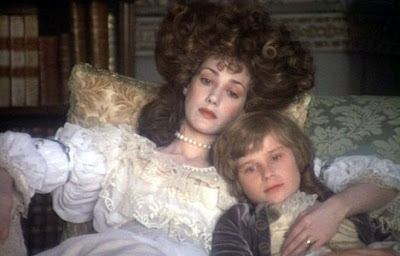 A highly paid model (before there were “super models”), Berenson is striking as the melancholy beauty whom Barry (born Redmond Barry in Ireland) wins away from her ailing and soon-to-be-dead husband Sir Lyndon. Lord Bullingdon (played, as a youth, by Dominic Savage) is sullenly perceptive of his new stepfather’s character—“a common opportunist.” The bad blood between them, spurred by Barry’s penchant for corporal punishment and extreme favoritism to his own charming (albeit spoiled) son, Bryan (David Morley), precipitates Barry’s final fall. Tracing a life’s rise and fall in this way was the task of the romance novel, derived from the sense that picaresque tales gave of the waywardness of life, its tendency to pile incident upon incident. The task of orderly narrative was to give such sprawl an “arc,” a pattern. 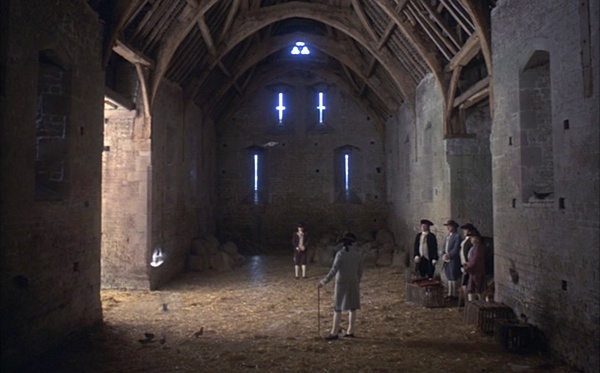 Kubrick’s film richly engineers such patterns—duels being a principal motif—but also hints, archly, that the incidents of the story are foreordained. 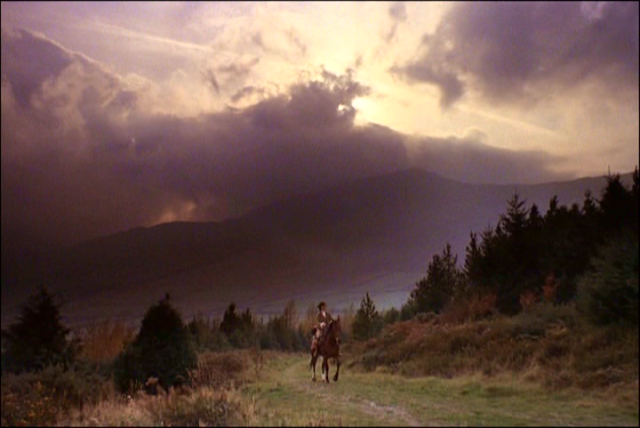 The great turn comes when the narrator (Michael Hordern, pricelessly dry) comments upon Barry’s partiality for Bryan and then tells us of the boy’s death before it occurs. In a moment, we know more than the characters in a huge way, and have no choice but to watch the inevitable occur. It’s a risky moment—giving the game away in that fashion (though it could be said that it was already more than likely that something bad would befall the boy)—and one that Kubrick’s sense of the cosmic confluence of opportunity and fate can’t help but register in this way. 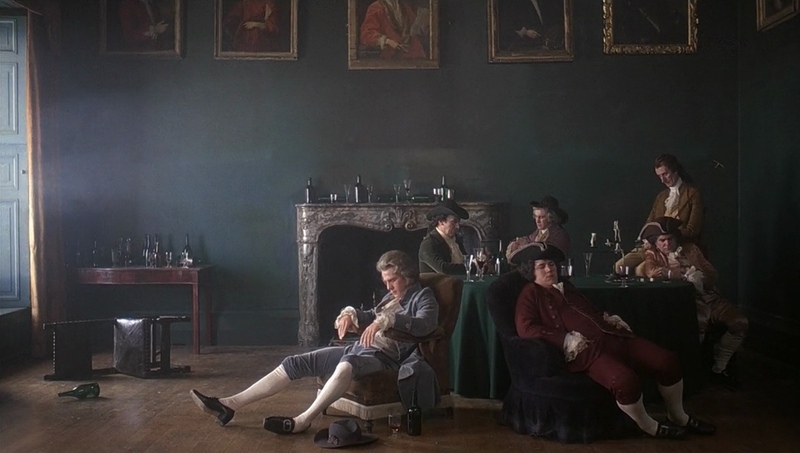 One might say that Kubrick has banked upon his film not changing, in the way that the paintings—particularly Hogarth—he mimics don’t change. If so, its fixity is also that of a musical piece that, having traced is variations, must always come to the same conclusion. We sit before this aural and visual tableaux with a sense of how it, like all museum-held heirlooms of a distant past, contains something about our own natures and the nature of our existence in time. At one point, King George III commends Barry on raising a regiment to fight the rebelling colonials in North America—suddenly we’re looking at a culture that is pitted against an upstart faction, and that faction, for the moment, might include Barry, though he chooses to identify with his betters. “Raise another regiment and go with them,” His Majesty quips, indicating how expendable Barry is, but also sensing, perhaps, that Barry was a common soldier himself in the King’s war against France. In many ways, Barry is a renegade and a pretender, and his place in this world, like the worth of art itself, is always a matter to be determined by machinations he can’t control. More like Joyce’s sense of the author than almost any other director one would care to name, as, like “the god of creation,” “indifferent, paring his fingernails," Kubrick’s grasp of the film seems to indicate he does control the machinations that doom Barry and that such might also be the means by which art attests to a greatness beyond comedy and tragedy, creating a perspective that, heretofore, only the best novelists and very few filmmakers had attained. I went to see this with my father when it came out. I don't really know why, since he never discussed Kubrick with me later, but he was totally excited about the film's release. After Part I, he was thrilled; at the end, he was totally let down. But I do remember that he said that it all fit together: the thrilling Rise; the torment of the Fall. Oddly, I remember nothing whatsoever about it! None of the pictures here strike any chord of memory! I think I did a better job imparting to my offspring the importance of this film than your dad did to his. Was he let down by the film, or by the story in the film? I'm beginning to notice that few of the heroes in my favorite films wind up in a good place. I tend not to be let down by this, because my hero tends to be the filmmaker rather than a character in the film, which carries over from my way of reading fiction to, which ultimately probably derives from the poet, the painter, the singer, the philosopher as each being the source of what I admire. That only sometimes carries over to novelists, and even more rarely to filmmakers, I'd say.